thanks again, hope you and yours had a wonderful Christmas. Attached you will find a picture; my parents like the Magnolia amp very much, my father said that it was the finest reproduction he had ever seen. The lamp cleared customs & was delivered about an hour ago. With that kind of packing it is no wonder it arrived in PERFECT condition. It looks PERFECT as well. Not only is the shade beautiful but it is as solid as a rock! this lamp back into my life after 20 some odd years of not being able to enjoy it. 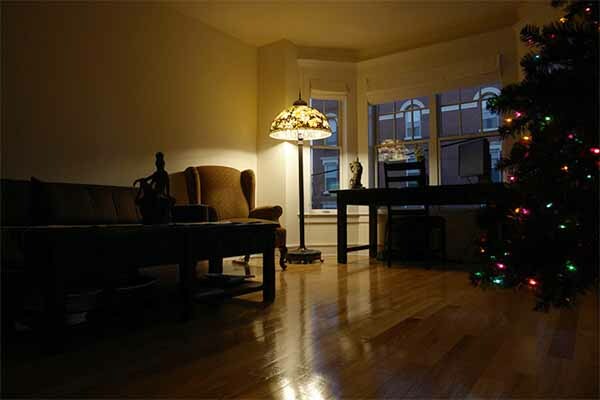 By the way, do you have a recommendation as to the best size bulbs with regards to the wattage. I think they are available in 40 or 60 watt sizes. Thank you again Peter. I will surely recommend your work to my friends. You are two people who are exceptional artists as well as wonderful people to do business with. had the photos of the original just near by). We look forward to getting the other lamps. Expect the wire transfer in the next few days. for a party on Dec 2. Is this possible? shapes of Japanese fans and Origami.--remember how close S. Bing and L.C.T. Thanks, and my thanks and best to your wife, as well. I finished uncrating and set up the lamps. To say that I was amazed and delighted would be an understatement. Those lamps are actually the most beautiful of my collection and are as beautiful as any of my originals. The two of you are true artists!!!!! Please feel free to use any of this in your reference library. I definitely will find time this summer to come visit. I am as interested in the artists as I am the lamps. We would like to thank you both for the seven beautiful lamps you have created for us over the past two years. Starting with the Wisteria and Geranium table lamps, the Geometric, Lotus Leaf and Butterflies hanging shades andthe Hanging-Head Dragonflies and Spreading Daffodil table lamps, you have gone from strength to strength. Although you try to remain as faithful as possible to the original Tiffany designs, your inspired use of colours and composition show a rare innovative artistic talent. 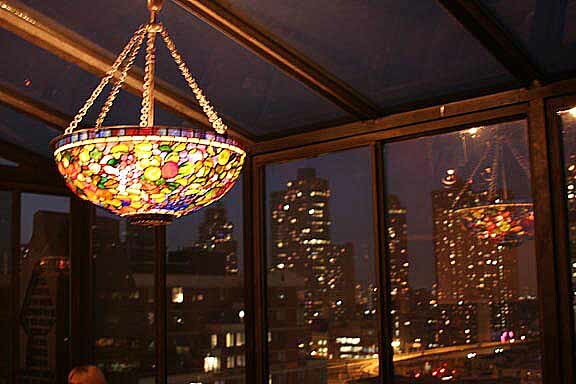 The combination of top quality glass and materials combined with your craftsmanship and an obvious love for what you are creating, results in a first class product following the traditions of the great Louis Comfort Tiffany. We strongly recommend anyone who wishes to own a fine reproduction Tiffany Lamp, to have it made in Essen. They will definitely not be disappointed! the lamp has been installed, with the smoke cap, and looks absolutely brilliant! The ultimate pleasure is still withheld as daylight saving time puts night time and darkness hours away. It already looks like something from the Arabian Nights, and plays wonderfully against the glass of the green house. Thank you both so much for bringing such artistry to to the craft you practice so superbly. I don't have a digital camera but, I'll have a friend take a few pictures next week, and send them to you. I wish you had been with us when my mother opened the box containing the restored lampshade. She wept with joy, and kept saying, "I didn't think it was possible" over and over again. You truly did a remarkable job and my brother Gary and I are forever grateful. This has been such a pleasure from our first contact until now. The whole birthday celebration was a great success. We had sixty five guests from all over the country who came to San Francisco to honor her. Now that the celebration is over, we have your beautifully restored lamp as a permanent joyful reminder of the great occasion, Both for us, and for generations to come. workmanship. It is a welcome addition to my glass collection, and it already looks very comfortable here in New York City. It is the KING of the collection, and my other pieces will act as royal subjects. I can not wait until nightfall, when I will illuminate my home exclusively, with the light from your lamp !!!!!!! I bet it will be even more beautiful at night time !!!!! I have a question about the proper way to clean the lamp shade. Should it be wiped with a dry towel ? Please give me specific maintenance instructions, so I can keep the shade in the best possible condition. Truly Spectacular !!!!! I still can't believe that one of your lamps now lives in my home. I hope this process has been as enjoyable for you as it has been for me. I look forward to seeing you later in the year so we can take some pictures together. Do you know when you will be in New York ? I hope this communication finds you in good health and great spirits. Thank you again for the best Birthday present I have ever gotten in my entire life. Just like a new baby, the lamp gets more beautiful each day. I have kept friends, family and business associates up to date with the great photos you sent. But you should see the reactions on their faces when they see the lamp in person. They are awe struck, almost speechless. After seeing the lamp in person, they can now understand the enthusiasm and optimism that I had throughout the entire process. Thank you for the cleaning instructions. Intuitively, I didn't think anything but a dry cloth would be appropriate for cleaning. When you firm up your plans to come to New York, please let me know. I don't usually do any travelling during December, so I will look forward to seeing you then. I will be monitoring your web site to see what you are working on. If I have any additional lamp plans, you will be the first to find out about it. Thanks again for everything. Regards to all. also perfect! Once I am able to move it, I found a perfect place for it. great. I find myself just sitting in the room staring at it! Your lamps are works of art. Mr. Tiffany would be very proud! Thank you again for all your help and personal attention to the project. congratulated for keeping the old art and craftsmanship alive!! from me again for future purchases. The lamp shade and base are all uncrated, assembled, and situated in a place of honor in my home!! Your crating system works very well, as nothing was damaged or marked in any way. Your work is truly remarkable - I can't imagine that the original designer could possibly improve on it in any way. Please see the attached photo. I'm very surprised with how heavy the whole assembly is - much more than I expected. My wife and I are extremely pleased with your work and are so glad that we decided to invest in the project with you. The colorations of the shade are very impressive and a delight to behold. We almost couldn't turn the light off last night as it was so pleasing to look at. The repair of the lamp's stem is excellent and exactly what I was looking for. Spending any extra time or money to try to improve the appearance would have been wasted. I consider the slight visual evidence of the repair to be a sign of distinction, like a few wrinkles on a wise person's face. Peter, we certainly appreciate all the efforts of you and your colleagues on our behalf and look forward to the many coming years of enjoying the evidence of your special craft. It's Dazzling, ...Fascinating, ...and Exquisite!!! I am more than pleased; ...it's Awesome. We unveiled it this evening without a problem, and it is in perfect condition. You sure did had it packed well! Perfect. The glass amazes me, and I love how you can turn the shade and view it all the way around. It is ART. You should be so very proud. The craftsmanship and the glass are so rare and beautiful you could look at it for days. Thank you. You have to tell me again how you found the glass, and how old it is. Every detail down to the cord and plug are incredible. XXXX was extremely impressed as well. Sure, ...go ahead and show me the mold for the "heavens project". And while you're at it, go ahead and make a small prototype. I don't see how broken pieces will twinkle like stars. :) But you're the boss. May be ready for the real thing by next Valentines'. choose the glass and follow the progress via my own web page. it will not be our last.